How Do We Write Taekwon-Do? Tae Kwon Do, three small and simple words. But what exactly do they mean and what is Tae Kwon Do? Well we can and will define what these words mean. That would be the easier task. The more difficult assignment would be to codify into words what Tae Kwon Do is. The reason that this will be a harder challenge to complete is because Tae Kwon Do means different things to various people. Additionally, once the reader has a better comprehension of this all-important area, they then can not only avail themselves of the benefits of Tae Kwon Do, but also discover how to better access those same benefits according to the individual needs of each prospective student of Tae Kwon Do. This can make a person’s individual path to growth, with and through Tae Kwon Do, more rewarding and more fulfilling. When this is strung together some will say that Tae Kwon Do is the “foot, fist, way” or the way of fighting using the feet and fists. I personally think this is a simplistic way of looking at it. In my view this basic definition also robs or cheats the student out of a more deeper understanding. But when we look at the actual definitions of Tae and Kwon, we see that they can be used as verbs, which describe actions, not nouns. Whereas, the Do is a concept and can be viewed as a noun. It comes from the Chinese word Tao. According to the Merriam-Webster dictionary tao or dao is Chinese for literally, “way” and its first known use was in 1736. 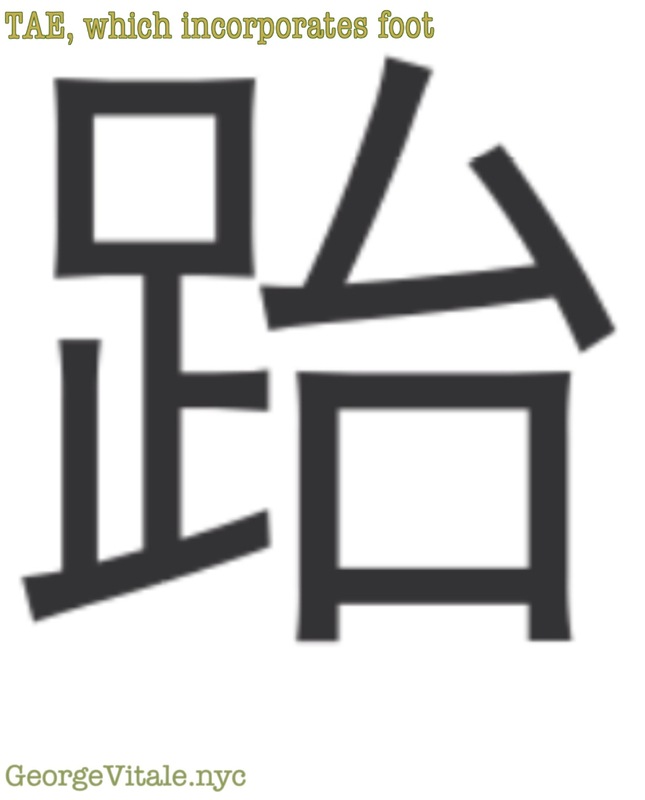 The Chinese HanJa character for foot and Tae are apparently different. The character for Tae incorporates the character for “foot” within it. Thus Tae is seen to mean an elevated foot, or a foot off the ground, denoting a word of action and not a noun. Kwon is a hand rolled or formed into a fist. Soo (or Su) was in common use at this time with more popular names like Tang Soo Do or Kong Soo Do. Grandmaster Hwang Ki the founder of the Moo Duk Kwan preferred this character for use in his new Su Bak Do name, when he repeatedly rejected the Taekwon-Do label. Kwon was also used with Kwon Bup, or Fist Method of Chinese Boxing. 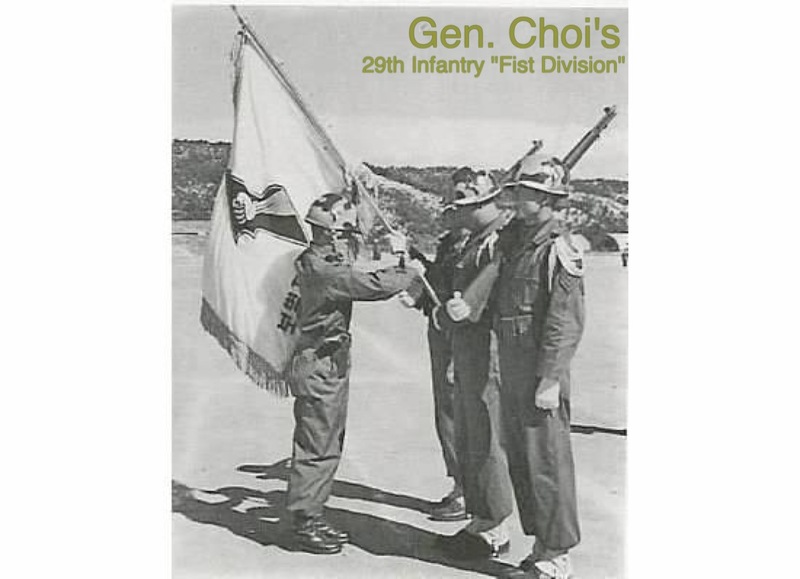 General Choi nicknamed the Korean Army 29th Infantry Division he formed the “Fist Division.” Colonel Nam stated in a personal interview they wanted to denote strength with the use of a fist and not simply an empty hand. The empty hand also had obvious connections to the Karate roots, as Kara-te means empty or open hand. So Tae Kwon Do, according to the man credited with naming it, is a martial art designed for self defense and requiring high moral character that must be used for justice. It has been written into English several different ways: Tae Kwon Do, Tae-Kwon-Do, Taekwondo and Taekwon-Do. This article will adopt the spelling of “Taekwon-Do”. The reason for this is that this format was the one utilized by the person who is most credited with actually coining the term. This was also the way it was written into English before most others even adopted the name. In 1959, a Taekwon-Do demonstration team from Korea went abroad for the first time to perform an exhibition for the outside nations of Vietnam and Taiwan. This was the start of the internationalization of Taekwon-Do. Since the team was made up of Koreans and they were to be demonstrating for audiences that had Vietnamese and Chinese as their native languages, the brochure was printed in Chinese, Korean and English, the language most often associated by many as the international language. On this brochure the name was written as “Taikwon Do” (1959). This format illustrates the separation of the two physical parts (Tae and Kwon) of Taekwon-Do, from the non-physical aspect, i.e. the mental, spiritual or discipline associated with the Do in Taekwon-Do. According to General Choi (personal experience from his lectures and communications), Taekwon-Do was written as such, as it joined the two physical parts of the art together, utilizing the dash (-) or hyphen to not only separate them from the non-physical mental aspects of the art, but to allow the “Do” to stand off by itself, as that was what he would say is the most important part of the art. This is a theme that appears throughout his writings. General Choi also taught that we state “TAEKWON” when we bow, just as he directed his soldiers to do when they saluted back in the early days of military training. He wanted people to come to understand and accept his new name. One of his students, the late Grandmaster Tran Trieu Quan, in a 2004 essay about the “Do”, explained that at least as early as his 1968 book, Gen. Choi wrote Taekwon-Do as such. (Note: the year of that this book was first printed was actually 1965, not 1968. It was the first book ever written about Taekwon-Do in English) Grandmaster Tran added that Gen. Choi also used the dash (-) or hyphen much like a bridge, as it was the demanding physical training that helped students over the passage of time to come to understand the “Do” better. It was in essence like a bridge leading one to the other. Earlier Gen. Choi, according to Grandmaster Tran (2004), mentioned that in the beginning (1955) his newly designed martial art was not well known. To “insure correct pronunciation of the name of the art, he preferred to write it as three separate words: Tae Kwon Do” (Tran, 2004). Colonel Nam in my interviews with him also stated that the soldiers shouted “Tae Kwon” when they saluted to also help insure the name circulated and became accepted. So as we can see from the above statements, the separation of the words that denote the physical aspects of Taekwon-Do, the Tae and the Kwon, from the word that symbolizes the spirit or non-physical aspects, took place as early as 1959, as evidenced by the printing of the historic demonstration brochure as: TAIKWON DO. Grandmaster Tran (2005) also wrote that the World Taekwondo Federation (WTF) writes it as Taekwondo, as they taught it was the bringing of the body and mind together, or “to emphasize the development of the body and mind as one”. Correspondence communicating an official statement about why Taekwondo was written in English as such was directed to both the WTF and the Kukkiwon, the World Taekwondo Academy. To date I am unsure of any reason, official or otherwise on why they have decided to adopt that spelling. 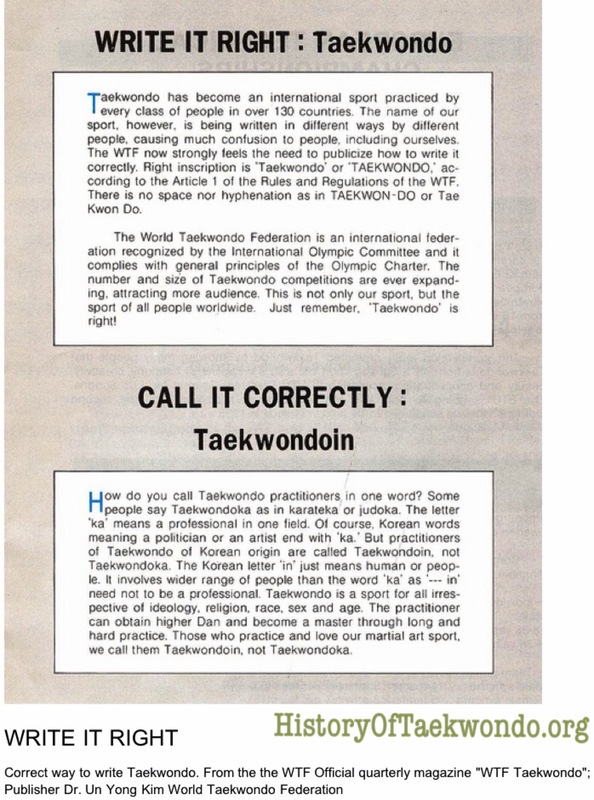 When you refer to the Official WTF Magazine page attached hereto, one will see that they do indeed officially list Taekwondo as the way they spell it. But no reason is given. Hopefully through the sharing of information, someone will be kind enough to educate readers as to the reason(s). General Choi taught that we should know the purpose, as the why to me is a critical part of understanding more clearly. Its a nice and great job for Taekwon-Do.